Maggie’s Penguin Parade launched last Friday in Dundee and saw the region and surrounding areas welcome 80 giant, individually designed penguin sculptures. Four penguins can be found around Perth and four of the penguins dotted across the region were designed by Perthshire-based artists, Alison Price Gail Robertson and Karen MacAllister. 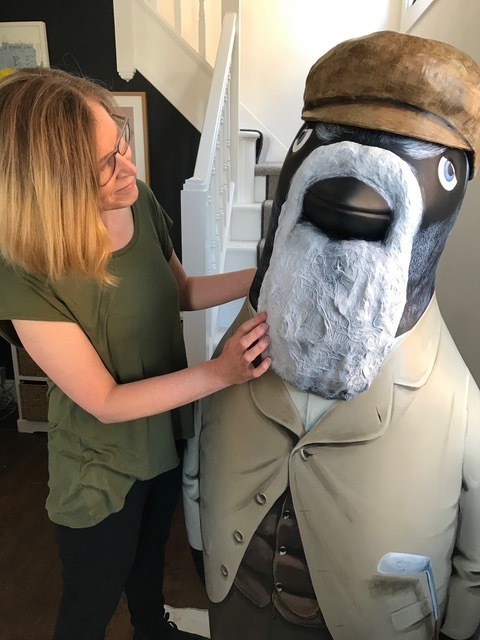 Alison Price worked with her sponsor, Carnoustie Golf Club to create a penguin, Old Tom Morris (No.29 on the Penguin Parade Map), bedecked in the style of their chosen golf legend. Having been one of the artists involved in the 2016 Oor Wullie’s Bucket Trail, also in Dundee, which raised over £883,000 for the Archie Foundation, Alison was keen to be part of this new project raising funds for Maggie’s Centres. Usually looking to the landscape for inspiration for drawing and painting, Alison had to learn a lot about golf history and work to transfer her 2D design to the 3D sculpture but used new materials and techniques with help from the Maggie’s Artist Co-ordinator, Suzanne Scott. A steep but fun learning curve! It’s been a fantastic way of using other skills and learning new processes along the way, I used to love painting portraits, so this has been a way to reintroduce an element of that into my work. As one of many artists and creatives involved in the Penguin Parade it has also introduced me to people from all over the country who have put their own stamp on what began as 80 identical penguins that will be transformed into 80 unique pieces of art that will hopefully be enjoyed by thousands of visitors over the summer months. So if the opportunity to get involved in public or community art projects comes your way, go for it! Self-taught painter, Gail Robertson, has painted two penguins for the parade. 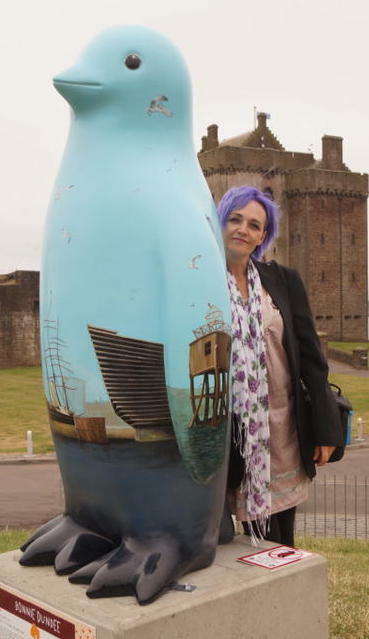 Her first penguin Bonnie Dundee is sponsored by Dundee-based celebrity Lorraine Kelly and will be situated at Castle Green in Broughty Ferry and is No. 1 on the Penguin Parade Map. 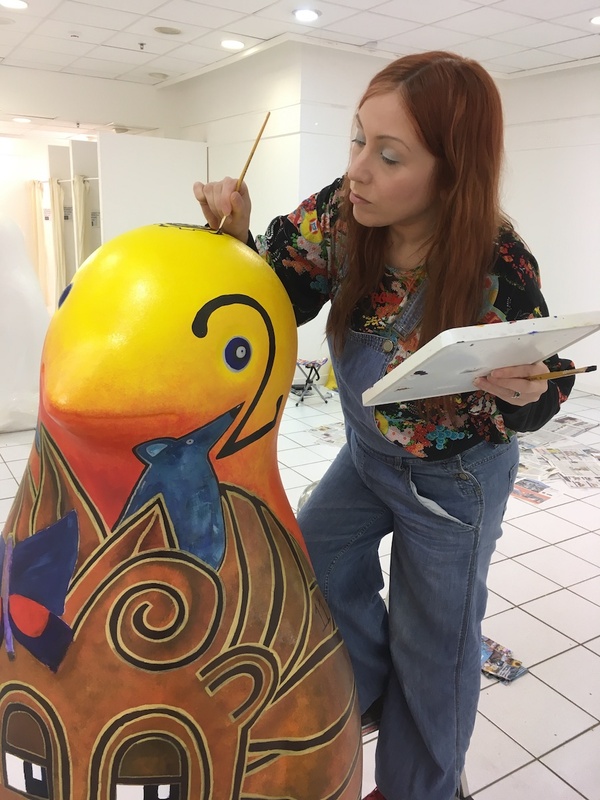 Gail’s second design, Telephone Penguin, is sponsored by the Keillor Gin family and will be positioned at the Overgate Centre in Dundee (No.48). Gail’s work has been described as quirky, unusual and different, and her penguins are no different! 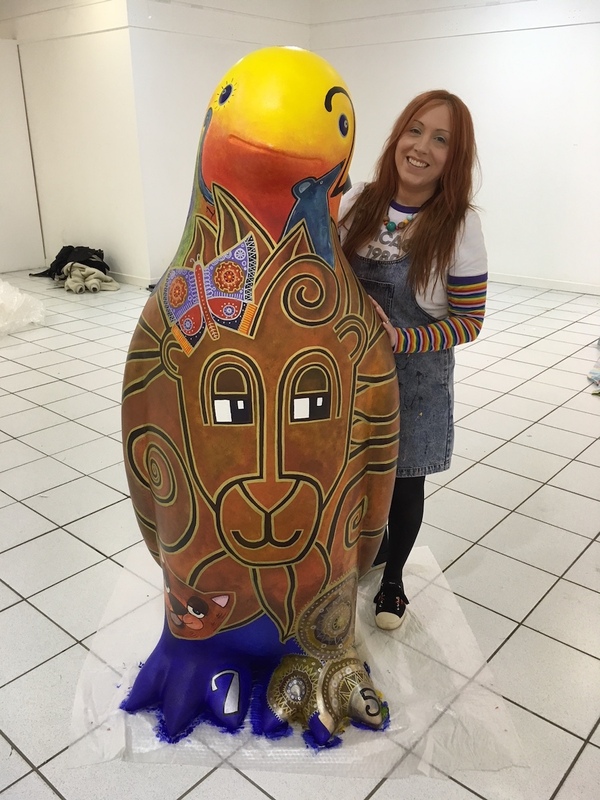 Karen MacAllister, a former Crieff High pupil and Duncan of Jordanstone Illustration & Printmaking graduate, is the creative talent behind Braw Illustrations, Karen created Tick Tock as her design for Maggie’s Penguin Parade. The design is based around the iconic imagery of the Wellgate clock and Karen’s memories of the clock as a child. Tick Tock was shortlisted by the Maggie’s panel and was subsequently selected and sponsored by the Wellgate Shopping Centre. Karen also painted Tick Tock in the specially designated penguin painting studio in the Wellgate. The focal point of Tick Tock centres around the lion and when painting, subtle colour changes from the concept illustration were made to allow for a greater visual impact, such as the use of gold lines instead of black surrounding the lion. Karen’s biggest challenge was constantly reassessing the colours knowing it would be predominantly photographed from the front. There is also a little game built into the design so that children can try and find all the clock numbers. Tick Tock can be found underneath the Wellgate clock on level 3 of the Wellgate Shopping Centre. (Location 61 on Penguin Parade maps). The Maggie’s Centre and Wild in Art teamed up to create Maggie’s Penguin Parade to raise money and awareness for The Maggie’s Centres which provide free support for people with cancer and their families and friends, offering a programme of support that has been shown to strengthen physical and emotional wellbeing. The Penguins will be on display all summer, culminating in a grand farewell event in Slessor Gardens, Dundee on 22nd and 23rd September before going to auction on September 24th. There are 4 Penguins to be discovered in Perth, and in addition to Dundee, Penguins can be found popping up in Angus, Kirriemuir, St Andrews, Brechin, Broughty Ferry & Newport on Tay, all shown on the Penguin Parade Map for anyone wanting to find them all. 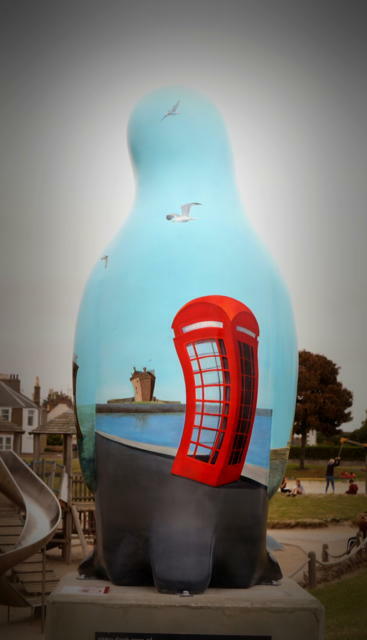 Top image shows Gail Robertson’s Penguin sponsored by James Keiller Gin located in the Dundee Overgate Centre.